The closure of Sanford’s US pencil factory last year was perhaps the final chapter in the story of US pencil manufacturing’s demise. Starting with the move of incense cedar pencil slat maker CalCedar’s manufacturing to China, and followed by Dixon’s departure to Mexico and China, Sanford’s exit was perhaps expected. Of course, the names and brands carry on. Papermate’s current website gives no indication of woodcase pencils being part of the product line. A weekend visit to a large office supply store revealed a hint of the future. The most expensive pencils in the large store, the box of 12 No. 2 Mirado pencils appears as they have for years, except for the statement “Made in Mexico”. The packaging still claims “The World’s Smoothest Writing Pencil – Guaranteed!” The cardbord box of twelve seems basically unaltered. 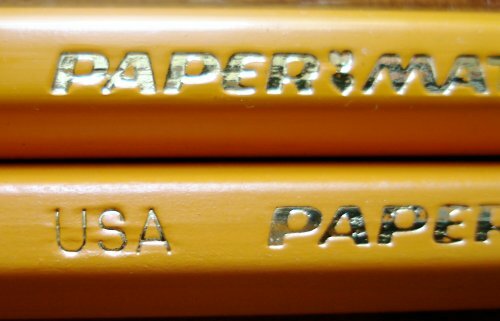 The pencils themselves are yellow, just like their predecessors, except missing the “USA” lettering. The manufacturing details appear slightly improved – they’ve reverted to an unsharpened format. Some paint spills over the end, but the problem of imprecise clamping of the ferrule appears much better. The varnish seems okay, not the best, yet certainly better than the “no name” pencils that supermarkets sell. I had no trouble sharpening the pencil in a manual sharpener, a desktop Carl, or a battery-operated Panasonic sharpener. A real surprise. I’ve never been a huge fan of this pencil, possibly because of the bland, generic appearance. But it writes quite well. Perhaps not as smoothly as pencils costing five times more, but still quite nicely. It certainly seems as good as the US made predecessor, and I’m wondering if it may even be better? The erasers seem exactly like those of the predecessor, pink with powdery (latex?) coating. At least while new, they work reasonably well, especially compared with other “pink” erasers. I am leaning towards a conclusion opposite to the one I thought I was going to make. Whether it is new equipment or some other factor, the new Mirados seem to be manufactured to a standard at least as high as their immediate predecessors. In some ways, it almost doesn’t matter where the pencil is made since the manufacturing process is so automated. It’s all done by machines for the most part. If the same machines are being used but in different location then the only difference is environmental. What worries me is where the materials and ingredients come from. Who wants grit in their lead or sandy erasers? Ick! Let’s keep our hopes up on these new Mexican made pencils. I was a big fan of the Black Warriors and Mirados until a few years ago, when they became crappy looking (the paint chips off the Warriors like crazy), and the lead scratchy. I had just given away a bunch of the older Black Warriors, which were much better made and which I instantly regretted. Live and learn . . .
Boris and Diane, thanks for the comments! We use these pencils in my department. I will use them if I misplace my mechanical but I have never really noticed them to be honest. I had to double check because I wasn’t sure what they were called. I have never really had anything to complain about, but then again, I have never used them for anything significant. I will say I am not a huge fan of the eraser on the Mirado as I have found on cheaper paper it tends to smudge the pink rubber on the paper rather than erase the pencil, too soft perhaps? I went and double checked the stock room and all the boxes of these pencils are still stamped with “USA”. I will look out for the new unstamped ones in the future. As a side note, I am new to this site and have found it to be very informational. I work in a an engineering department where manual drafting is not completely dead, although it might as well be. It’s not unusual to find Mylar and linen drafting prints still kicking around the office. I plan on purchasing some new mechanical pencils soon including a lead holder after reading some of the reviews here and else where. Keep up the good work, there are those who appreciate it. Actually current status is that the US plant in Lewisburg is still operating on one production line until around May this year. So it’s likely with inventory out in the distribution channel you’ll still see the USA stamp for some period of time through 2010. While I understand that given the situation with major producers moving offshore you may feel we’ve reached the ultimate demise of US pencil manufacturing there are still fine companies dedicated to making pencils in the USA to support. Among these are Musgrave Pencil and General Pencil which I recently wrote about in my Timberlines blog. Regarding Boris’ comment on materials. Transparency on topics such as raw materials relative to consumer products safety, environmental sustainability, accurate country of origin, trade regulation and duty compliance performance issues has always been an important matter to us at CalCedar and Pencils.com. With increasing proportion of US pencil consumption comming from imported, non traditional branded producers we see increased problems in this area that the industry must learn to deal with and address proactively. At our company we consider such a transparency policy part and parcel to building a sustainable and trusted business over the long term. In our pending redesign of our Pencils.com store site due to launch in a couple months we will be doing much in this arena to help consumers make better informed choices regarding thier pencil purchases. Please note that my comment is not intended to make any negative inference relative to Newell’s own transparency on moving production of Mirado and other branded pencils to Mexico from the US. As one of thier wood suppliers, whether we agree or not with thier ultimate purchase and production decisions, we know they are concerned about these issues and work as closely as we can with them as well as our other customers to address such matters. Thanks for reminding us about Musgrave and General Pencil, Woodchuck—they still make quality pencils that deserve better national distribution. I’ve always thought that the Musgrave Unigraph is one of the most beautiful pencils still being made anywhere in the world and that it can hold its own alongside the green Faber Castell. General’s Cedar Pointe is also excellent. We forget about these “other” American pencil makers sometimes because their products are rarely if ever found in stores. It would be great if there was a history of marking origin of manufacturing with the origin of ingredients. For example, what if the Mirado packaging said something like, “Made in Mexico with US and Chinese Materials”. The automotive industry does something like this. There is usually a sticker somewhere that shows the percentages of each country’s contribution to manufacturing of the vehicle. Unfortunately, I don’t think a marking like that will ever appear on most products. Woodchuck, this may be a question more suited to your blog but I will post my question to you here since there is a dialog going. Do you really grow and harvest trees in California and transport them to China? Is that really cheaper than using a sawmill or processing plant somewhere in the US? I can imagine that California may not want a sawmill but what about neighboring States? Thanks for your question. I have written about this topic in the past in my Timberlines blog, but here is a two paragraph answer. The growing range of Incense-cedar trees is primarily in California and Oregon (somewhat into Baja California). The trees are harvested and cut to a variety of lumber products in various sawmills in both states. Lumber used for pencil slat production is called “pencil stock” or “pencil plank” depending upon it’s dimensional specifications and the sawing equipment used to process into pencil slats at different slat factories around the world. Note that the whole tree is not exported as a log because several different produts are produced from the log at once. Some of these products are further processed into various items serving the US building materials. Historically, CalCedar produced the “pencil stock” into pencil slats in our facility in Stockton, CA, but we now ship this material to our slat factory in Tianjin, China. Unfortunately as other cedar sawmills began exporting pencil stock and plank to Asian customers and other Asian wood species entered the market in these countries the competitive dynamics changed dramatically in the 1990s. Due to high labor content to process, grade and sort pencil slats the labor and other operating cost savings in these countries outweigh the extra transport costs of shipping the pencil stock to China or Indonesia. 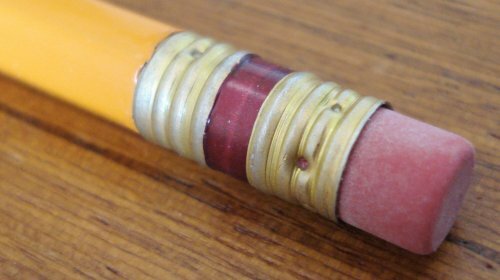 …y still had the usual smooth-writing cores, and they were fairly easy-sharpening for basswood pencils. Still, the finish was rougher than a pencil of that caliber should be. BCS, very interesting! A page at the Japanese pencil organization website which records a tour of CalCedar Tianjin, notes that the growth of Basswood and decline of Cedar is a major industry shift, and was part of CalCedar’s motivation for their move. Yet – a basswood Unigraph? USA Gold pencils are also still made in the USA. I just bought a 24 pack in yellow at Wal-Mart. I also find them at Target in yellow plus natural sometimes. The package says the wood is California incense cedar. The packaging has a large flag with MADE IN THE USA running underneath it. The imprint on the yellow ones is a bit sloppy, but I like their more mellow yellow compared to the super bright Dixons. The USA Golds sharpen very well and write very well. I’ve been using the USA Gold Naturals at work lately as a comparison to the Black Warriors. I sasw them at Target here in the USA and thought I’d give them a go. They are definitely cedar, but seem to be a slightly different cedar from the Black Warriors. I like the coated natural finish, but probably prefer the graphite of the Black Warriors a bit more. I tend to use 4 pencils at time, sharpening all of them at the same time when needed. There used to be a home company site where you could select various pencils from dropdown menus and see individual (but limited) info pages for them. The site is/was here: http://ebusiness.newellrubbermaid.com/sanford/consumer/papermate/products-pencils.jhtml. But as of this date, the dropdown menus no longer work. So you cannot access any info on the pencils they are still selling. As well, on the main http://www.papermate.com site, no woodcase pencils anywhere. If they were actually creating a new site for them (transferring from an old site), normal practice is to let people know they are doing so. Its as if they don’t want people to know they still sell them anymore. At least there are still other manufacturers who have no problem showcasing their woodcase pencils. I purchased some triangular Mirados at Big Lots yesterday. These were pencils made in Mexico and destined for sale in Mexico. They had markings in Spanish and came in a packaged labeled in Spanish. They were marked mediano for the grade with the accent appropriately placed on the “e” in Mexico. I have taken them out of the package, but I have not written with any of them yet. Update: I have started to use one of the triangular Mexican Mirados. It sharpens well and writes like any other Mirado. The red line on the ferrule is finished without the kind of irregularites that I have seen on other recent Mirados and apparent in the photographs above. The exterior color is a vibrant yellow orange similar to the color of the Papermate Classic and the writing on the pencil body is gold-tone. The package referenced Berol and Papermate, but the writing on the pencil includes Berol without any reference to Papermate. Although this has nothing to do with the quality, I prefer hexagonal to triangular pencils. I’m still adjusting my grip to accomodate the shape. It should be noted that I don’t know when these pencils were originally manufactured or if this version of the Mirado is still being manufactured. Bob S., what kind of wood do you think they are? Basswood? I’d pointed about these pencils as well in “Comments & Questions”. I’m OK with triangular pencils, but hex still feels the best. One of my nice mechanical pencils is triangular as well. I don’t know enough about wood to answer that question. However, upon sharpening, the wood turns out to have a pinkish tint rather than a pale white tint. I associate the white tint with some of the newer woods that I see in current pencils vs. older vintage pencils. Does basswood have a pale white tint? 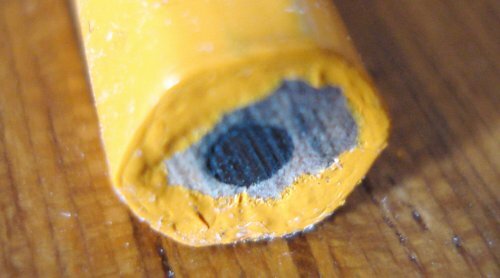 I also don’t know whether pencil manufacturers can or do dye the wood if they want to achieve more of a vintage pencil appearance. The papermate plant in Mexico is an extremely nice and clean one. The raw material is all imported from the USA, a problem that keeps mexico poor because the only thing they produce is the labor. All the machinery and raw materials are brought from the US and much of the maintenance equipment like forklifts, dock equipment, pallet racks, shelving and storage equipment and many times the furniture comes from the US even when they make great furniture in Mexico. A sustainable market is never created in Mexico so it doesn’t grow and just stays poor. This is the governments fault becuase of business unfriendly tax laws, rampant corruption and now insecurity. It should have huge growth in a recession since Brazil and Argentina are seeing 10%+ economic growth rate. I am kind of confused with the process of creating this pencil. I know the wood is from CA, but where do you get all of the other components such as the graphite, eraser and ferrule? Do all of these come from the same place, or do they come from different companies/countries. If so, what companies produce them and where are they located? Hi Maria, this blog occasionally looks into such questions, but specific information is often regarded as proprietary. I find that the USA made Mirados were of much superior quality. I always used the Mirado Classic Black. I was horrified the first time I saw the new Classic Blacks. The finish was not as good, and the paint was chipping around the bottom of the ferrule, ruining the otherwise classy style of the pencil. There was some streaking in the finish. However, I have been using the new Mirados and have to say that the quality is sill much higher than the standard yellow pencil. In fact, there is no difference in performance, just slightly less overall quality. I haven’t seen this ugly paint chipping and streaking problem with the regular Mirados. Though I wish they were still made in USA. I have a few Classic Blacks that I will hold onto, they are probably the best pencil. I have a stockpile of the Made in USA Mirado Classics, and I’d be happy to trade some for a few of Mexican-made Miradoes (or anything else interesting and unavailable in the UK). I’m keen to try the Mexican ones side-by-side with their older American brothers to see how they fare. Send me an email to hello@koralatov.com and we can get something organised. I dont know if the quality is less than it was before but most of the time, my students are not able to sharpen there pencil by themeselves. The lead doesn’t seem to be glued enough inside the wood. Also, the lead brokes in the manual sharpener so a new pencil is often wasted in 5 minutes just trying to sharpen it. I finished my stockpile of U.S.-made Miradoes Classic, and bought some of the new, Mexican-made ones. I didn’t have the foresight to hold one or two of the U.S. ones back for a side-by-side comparison. I like the new ones. The finish seems a little better than the late U.S. ones, and the erasers are better. This could be due to them being newer. I don’t know how long my U.S. ones had been sitting; I always found the erasers dry and scratchy. The core is smooth and doesn’t have any grit. It seems about half a grade darker than the older pencils. I think I actually prefer the new cores for their extra darkness. No idea what wood is being used in these new ones, though. They don’t smell like cedar when they’re sharpened. They don’t really have a smell at all. The wood is a very pale colour. On the older ones, the wood had a pale pinkish hue. Can anyone cast any light on this? Are they still cedar, or have they moved to using something else? The box they came in didn’t mention the wood used, and I’m sure they used to advertise that they used cedar.